We're headed to Toronto this time round, and it's well worth the trip. 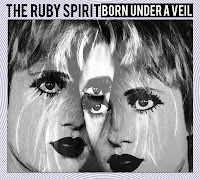 The Ruby Spirit are "kaleidoscopic indie-rockers", which I've personally translated into simply meaning, it's fun. Their album "Born Under a Veil" is set for release September 4. It is very simply, awesome. Paige Boy, is the voice that leads the way, and she produces nothing but smooth vocals that do wonders. Behind her, the rest of the band (Alex Pulec, Mickey Donnell, Jay Cipparrone, Juliana Eye), play music that is driving, sometimes hypnotic, but constant with positivity and happiness. Listening to it just makes me feel good. It's the type of music that lends itself to just about anything. The band is gearing up for a supporting tour of the six song E.P. The album has a good variety of sound, my favourite tune has got to be Caligari though. I really dig the organ in it, and Boy sings her heart out in parts. With nothing but positive reviews in regard to their live show and stage presence, the energy behind this album would be very worthwhile catching live. Their album release show in particular sounds very intriguing. The group is taking over The Great Hall in Toronto (Queen and Dovercourt) on September 4, and turning the space into a multi-dimensional atmosphere. A great opportunity to see The Ruby Spirit in their element. If you need an album for your next road trip, bike ride, walk, run, paper-route, whatever, this is no waste of your time. You don't need to be in any certain mood to listen to The Ruby Spirit, and in the end, it always leaves you in the same mood...a great one. your review is so spot-on. it's definitely a recording that always leaves you in a good mood! glad we agree! hey I landed on your page from the BuyingShotsForBand page. Love your review of the EP and your site! A Farm Boy’s First Folk Fest Experience. Song of the Day on CBC today!! Living in Vancouver with my wife and our dog Tobias. The Ride: Update 7 - Bout time I wrote on here! Dan Mangan, need I say more?